You are here: Home » Schnitzel again? The summer between my 9th and 10th grade years, my family was able to take a trip to Europe. We flew into Germany, drove down to Austria, through Switzerland and then to the south of France. While having German ancestry on both sides of my family, I had not really been exposed to much in the way of German food. In fact, I don’t really recall having my first bratwurst until college. Shortly before we went, though, my father made wiener schnitzel. It was like the best part of veal parmigiana (which I had eaten). So when we went to our first restaurant in Germany, my brother and I both ordered the schnitzel. Not a problem. Next restaurant, we both ordered the schnitel. Curious, but still wasn’t and issue. By the third restaurant, my parents wanted us to branch out our ordering and forbid schnitzel. I think I ordered a wurst platter. While good, it still wasn’t schnitzel. Chicken schnitzel is known as Hähnchenschnitzel in Germany. If you can buy thin sliced chicken breasts, even better. Stone ground mustard is so good. Some don’t like the seeds, but I do. The schnitzel making station. I like these tubs. They used to hold lunch meat that I bought at a warehouse club. They are my go to containers for ingredients that I chop and are waiting to make it into a dish or other things. They are the perfect size for this. Then bread crumbs and into the frying pan. Whisk the yogurt and mustard in a bowl until smooth; set aside. Pulse the bread in a food processor until finely ground. Transfer to a shallow dish and add the marjoram, and salt and pepper to taste. In another shallow dish, season the flour with the paprika and nutmeg. Beat the eggs in a third dish. Season the chicken with salt and pepper. Dredge each cutlet in the flour, shaking off the excess. Dip in the eggs and then in the breadcrumbs, pressing to coat both sides. Place on parchment paper until ready to fry. Heat 1/8 inch of vegetable oil in a large skillet over medium-high heat until hot. Add 2 cutlets, gently swirling the skillet so the oil washes over them, and cook until golden brown, about 3 minutes per side. Transfer to a paper-towel-lined plate and season with salt. Repeat with the remaining chicken, adjusting the heat as needed. 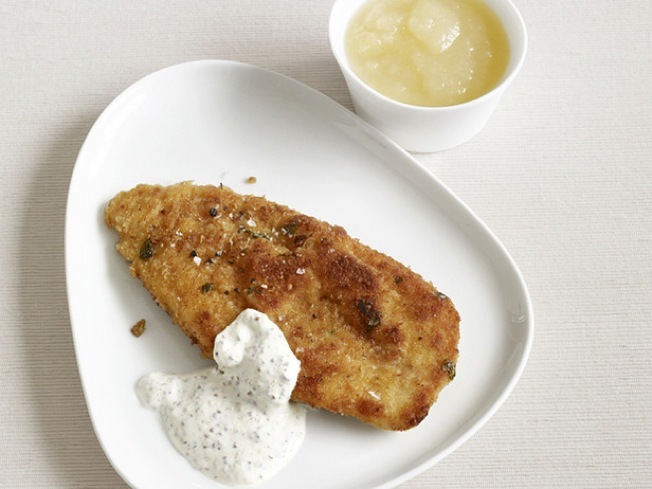 Serve the schnitzel with the mustard sauce and applesauce, if desired. Funny-this is THE most popular children’s (and not just children’s) food in Israel! It is usually eaten here with chips (french fries) by the kids. Considered the ultimate best meal by kids here, and many mothers really wish their kids would expand their culinary taste to other things, but many never do. If you go to tourist areas in India (where there are always many Israelis) you will find on the menu a category “Israeli Food” and the main thing offered is Schnitzel and Chips!! It has now become the most widely sold ready-to-eat microwave frozen food in the Israeli supermarkets as well!! Love wiener schnitzel. They also serve it with a fried egg on top and call it Holsteiner Schnitzel, delicious! So it’s essentially fried chicken? How interesting. I love schnitzel, one of my favourite foods. With try your sauce but I love it with spaghetti and tomato sauce. hahaha, I order it frequently when I’m in Germany, much to my girlfriends chagrin, but then she understands that I don’t get it all that often, hehe. Your title cracked me up! When I was a child, I was part of a group that toured Austria. As we were hosted by families and groups, we of course ate whatever they served us, and as Weinershnitzel was their traditional home dish, it was what we were served just about every night. Your title was something many of us were saying by the third or fourth evening on. Good dish, but my enthusiasm for it just wasn’t the same. My grandmother was german and she and my father made shnitzel quite often. We always had it with sauerkraut (homemade) and mashed taters. This sounds really good! I do not eat veal because I think that the treatment of the calves is inhumane. My grandson has become vegetarian at the age of eight. I am not to that point yet, but as someone who has raised cattle, I care greatly about the treatment of domestic animals. The why in which many animals are raised for consumption in this so-called modern era simply is not acceptable. I don’t eat veal either but I eat beef and people think I’m insane, nice to know someone else out there feels the same. We spent 10 days in Germany during the Christmas/New Years season at the end of 2007. On a day excursion to Heidelberg we ate lunch at a small restaurant on the town square. I ordered jagerschnitzel and must say that I have never eaten anything so delicious before or since. That’s the year my father-in-law decided to roast goose for Christmas dinner and came back with a duck instead. For the record, one duck just feeds 4 adults. No left-over duck sandwiches the next day. Great idea reusing the deli tubs for “schnitzel dipping stations.” I always use pie plates, but they are so big and bulky (and take up too much room in the dishwasher). Thanks for the tip! Yum! I’m totally going to make this is the winter with some boiled potaoes and red cabbage.